Mexican textile specialist Chloë Sayer takes a closer look at indigenous clothing from the V&A's collection and some distinctive examples worn by Frida Kahlo. When Frida Kahlo married Diego Rivera in 1929, she wore floor-length skirts and a fringed rebozo (rectangular shawl). She would later acquire a range of indigenous clothing from several places in Mexico and Guatemala. 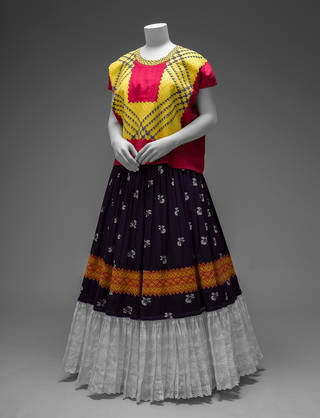 Kahlo's fondness for indigenous clothing reflected her admiration for artisan traditions, and her commitment to her native Mexico, where distinctive styles of dress in Oaxaca and other regions are intimately linked with cultural identity. In most indigenous communities in Mexico, textile skills centre on the creation of clothing. Skilled weavers create cloth of great beauty and complexity using the native backstrap loom. Although the apparatus is simple, with no rigid framework, it is extremely versatile. Traditional garments are not tailored in the European manner: instead they are assembled from squares or rectangles of cloth. 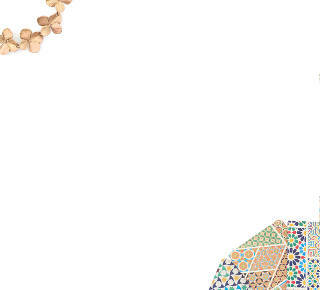 Texture and patterning are crucially important. Brocading, often mistaken for embroidery, uses supplementary weft threads (the yarns that run across the width of the fabric) to embellish garments with flowers, birds, animals and geometric motifs. Gauze-weaving is another ancient skill: threads, crossed by hand, form open-meshed cloth with the delicacy of lace. After the Revolution, when Mexican leaders and intellectuals were keen to build a sense of nationhood, the Tehuana became a cultural symbol. 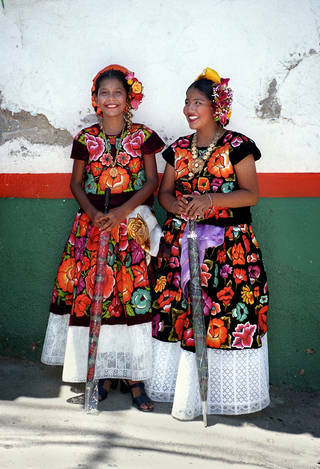 Widely represented in the popular media, Tehuanas (Zapotec women on the Isthmus of Tehuantepec) were admired for their flamboyant style of dress. Today, Tehuanas remain proud of their cultural identity. Visual and written sources document the evolution of clothing in the region. In 1828, the Italian artist Claudio Linati published a lithograph showing a 'Young Woman of Tehuantepec'. She wore a wrap-around cotton skirt, woven on the backstrap loom. Covering her head and torso was a white gauze-like garment, known locally as a 'huipil grande'. By 1859, when Desiré Charnay (the French explorer and archaeologist) visited the Isthmus, women had adopted a very short huipil. A print made after a photograph by Charnay showed the frill of the huipil grande framing the wearer's face. Tehuana clothing has continued to evolve, reflecting the changing tastes of wearers. Kahlo took pleasure in combining indigenous garments from different regions. Sometimes her idiosyncratic ensembles included European or Asian garments. But she was especially fond of the flamboyant style of clothing worn on the Isthmus of Tehuantepec. A famous photograph taken by Nickolas Muray in New York shows her wearing one of her Tehuana ensembles. Her voluminous skirt is trimmed with hand-made lace; geometric designs, chain-stitched on a sewing machine, decorate her huipil of commercially made cloth. Frida Kahlo in New York, by Nickolas Muray, 1939. © Nickolas Muray Photo Archives. Kahlo's unique dress style continues to inspire designers the world over. Importantly it also focuses attention on the technical prowess and enduring heritage of weavers and embroiderers across Mexico and Guatemala. The huipil is best described as a sleeveless tunic. Worn by women in many regions of Mexico and Guatemala, it evolved over two thousand years ago. If the huipil is made on the backstrap loom, various textures and designs are created in the cloth as it is woven; bought cloth may be decorated with embroidery, or oversewn with lace, braid and ribbons. Although some huipil styles are constructed from two or three widths of cloth, others are formed from a single width. Long garments hang freely, sometimes reaching the wearer's ankles; short garments stop at the waist, or are worn tucked inside the skirt. Thanks to its geometric construction, the huipil helped Kahlo to look taller and, when she was seated (Kahlo spent her final years in a wheelchair), prevented the fabric from bunching up around her waist. The state of Oaxaca has a large indigenous population and many styles of huipil. Our textile collection includes a fine ankle-length example, made over a century ago, probably in the Mixteca Alta region – where Mixtec and Triqui weavers still create traditional huipiles on the backstrap loom today. 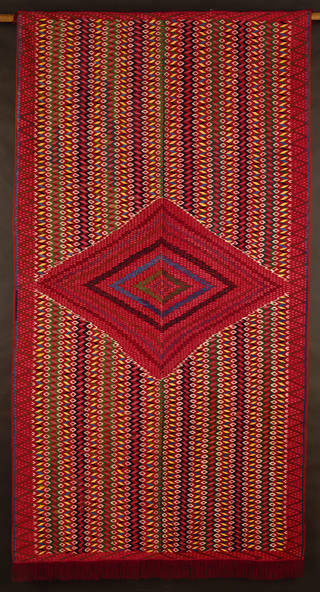 This huipil was woven in three widths from white cotton thread, with alternating bands of plain and gauze weaving. Brocaded bands, worked with red and blue cotton, feature zigzags, chevrons and lozenges. A round neck opening, hemmed in red, has been cut in the centre panel; the garment's sides are seamed, leaving large openings for arms. Huipiles of this type hang down over a wrap-around skirt, held in place by a woven waist sash. Huipil, unknown, 1875 – 1890, Oaxaca state, Mexico. Bequeathed by Alfred Percival Maudslay. Museum no. T.38-1931. © Victoria and Albert Museum, London. The colonial-style blouse (blusa or camisa in Spanish) has been widely adopted in indigenous areas of Mexico. 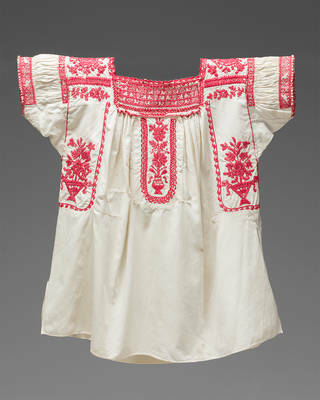 Inspired by the European chemise, it has replaced the huipil in many communities. In earlier times, blouses were made from panels of home-woven cloth. Now makers rely on commercial materials such as manta (calico), organdy (fine cotton muslin) and popelina (a strong plain weave fabric), or eye-catching satin-like fabrics in brilliant colours. While some blouses are tailored to incorporate frills and tucks, others are unfitted and angular in their construction. Blouses from the Valley of Mexico and the state of Puebla have a box-like appearance: characterised by their square underarm panels and square necklines, they are often distinguished by richly embroidered yokes and sleeves. The example belonging to Frida Kahlo, embroidered with large floral designs in red satin-stitch, was made in the Nahua area of Puebla state. 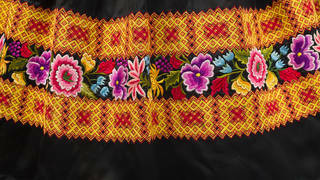 Smaller motifs, many showing birds and animals, form bands of pepenado fruncido – an elaborate embroidery technique. Running stitches pattern the minutely pleated cloth to form the ground; the white areas that remain form the designs. 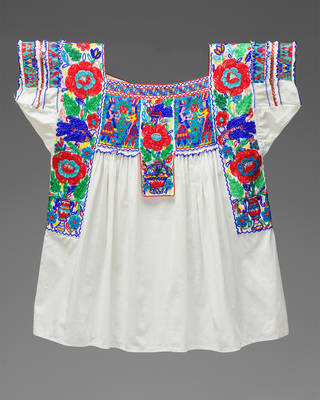 The beaded ceremonial blouse, also from Kahlo's wardrobe, is from the Nahua village of San Gabriel Chilac, Puebla state. Intricate designs, embroidered with imported glass beads on cotton cloth, include flowers, birds and 'Aztec' dancers. 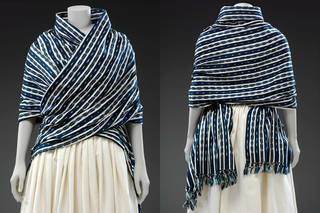 The sarape, an overgarment widely worn by men in rural areas, reached its zenith during the late 18th and early 19th centuries. Sheep, (especially Merinos), introduced soon after the start of Spanish rule, and Spanish textile technology, represented by the treadle or shaft loom, led to the rise of numerous weaving centres. The finest sarapes were said to come from Saltillo, in the northern state of Coahuila. Competing workshops also flourished in the states of Zacatecas and Querétaro. Sarape, unknown, 1880s, Mexico. Bequeathed by Alfred Percival Maudslay. Museum no. T.19-1931. © Victoria and Albert Museum, London. Our collection includes a sarape, thought to date from the 1880s, which was tapestry-woven to dazzling effect. Two panels, individually woven with a cotton warp and a wool weft, were seamed together to leave a central opening for the head. The owner would have worn it like a South American poncho; alternatively, he could have draped it over his shoulders like a cloak. With tapestry weaving, threads of different colours form a discontinuous weft: as they move across selected areas, they create designs in the cloth. Here, the central area is dominated by a series of concentric diamonds. Interlocking geometric motifs, forming vertical stripes, pattern the rest of the ground. Natural dyes such as indigo and cochineal were used before the rise of synthetic colourants. A red silken fringe has been added at both ends. In recent decades, commercially made coats and jackets have largely replaced the sarape. Long and rectangular in shape, the rebozo (shawl) evolved during the colonial period to become a symbol of womanhood and — after Independence — nationhood. Nineteenth-century paintings and lithographs show Mexican women of all social classes wearing rebozos. Many were patterned with the ikat technique, known in Mexico as reservado (reserved) or jaspe (mottled). Makers create colour sequences by tie-dying selected warp threads before they are woven. Subdivided into sets, they are tightly bound and dipped in a dye-bath. The covered portions are 'reserved'. If further colours are desired, the weaver binds new sections and re-dips. When setting up the warp on the loom, care is taken to align the designs. The warp threads of the finished rebozo are knotted at both ends to form a fringe. The rebozo has many uses: it offers the wearer protection from sun and cold; it also carries goods and infants. 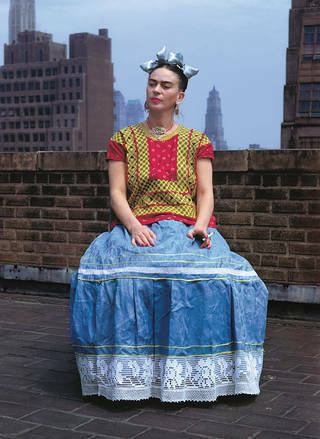 Kahlo was frequently photographed wearing one and it became an essential component of her style. 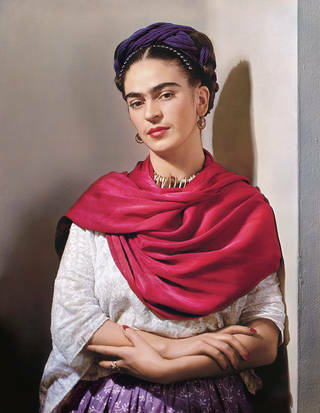 Frida Kahlo with Magenta Rebozo, by Nickolas Muray, 1939. © Nickolas Muray Photo Archives. Indigo was used to dye a late 19th-century cotton example from our collection. Plain white and plain blue vertical stripes alternate in sequence with blue-and-white ikat stripes. The town of Tenancingo de Degollado in the state of Mexico still has a long-standing connection with cotton rebozos of this type. Dying and weaving skills are passed down from generation to generation in small treadle-loom workshops, where as many as thirty rebozos are woven with a single long warp. Santa María del Río, in the state of San Luis Potosí, is another important centre for the production of ikat-patterned rebozos. These are woven with real or artificial silk on the backstrap loom. Like the man's sarape, the rebozo has been losing favour to mass-produced and more modern styles of clothing. Rebozo, unknown. 1875 – 1890, Mexico. Bequeathed by Alfred Percival Maudslay. Museum no. T.21-1931. © Victoria and Albert Museum, London. Before the Spanish Conquest, women wore wrap-around skirts held in place by a waist-sash. In many indigenous communities, fine examples of this style of skirt are still assembled from panels of home-woven cloth. Some skirts are rectangular, while others are seamed to form a tube. Each morning, when the wearer puts on her skirt, she arranges the cloth in a series of folds or pleats. In recent decades, wrap-around skirts have given way to skirts on waistbands in many regions. In one example worn by Frida Kahlo, the skirt, known locally as an enagua, fastens at the side with fabric ties. The cotton lace flounce or holán is easily detached so that it can be washed and starched. Patterned cotton cloth of this type, printed with floral and other designs, was often imported from the English city of Manchester. The introduction of the Singer sewing machine at the start of the 20th century generated a fashion on the Isthmus of Tehuantepec (in the state of Oaxaca), for geometric designs, densely worked in chain stitch. The enagua is still used on the Isthmus for formal occasions. The rabona, a lighter style with a pleated flounce of the same material, was also worn by Kahlo, and remains a popular item of everyday wear on the Isthmus. 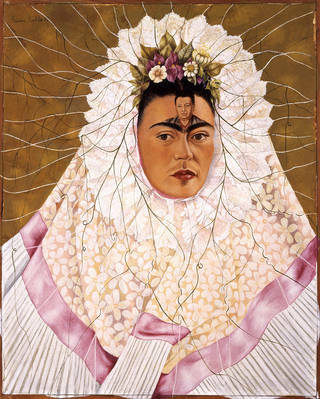 Kahlo's Self-portrait as a Tehuana, painted in 1943, shows her with the Tehuana's ceremonial lace headdress. The origins of the huipil grande – now also called a resplandor – are unknown. Worn in two ways, it resembles a small huipil with a ruffled collar and a wide frill along the bottom. Vestigial 'sleeves', glued fast by starch, are never used. On full-dress occasions, the wide frill surrounds the wearer's face like rays of white light, while the collar and sleeves hang down behind. In church, however, the ruffled collar frames the wearer's face: the garment covers the shoulders like a cape, with one sleeve in front and the other behind. In her self-portrait, Kahlo has chosen the second style. Self-portrait as a Tehuana, by Frida Kahlo, 1943. 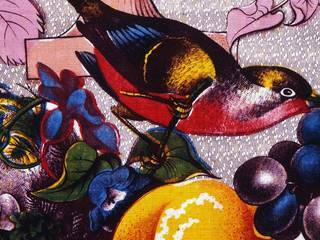 © The Jacques and Natasha Gelman Collection of 20th Century Mexican Art and The Vergel Foundation. Find out more about Mexican embroidery styles in our collection.